A nose of breeding and distinction sets Miss Louisa Belle apart from the pack. 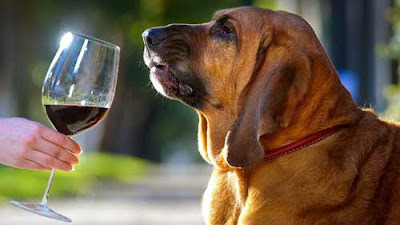 The seven-year-old red bloodhound has such a superior sense of smell that she has been trained to detect tainted corks affecting wine. Her Australian owners, Michelle Edwards and Daniel Fischl, said when faced with a pile of corks, Belle meticulously selected those that had been tainted by putting them to the side with her snout. "She just has to sniff a barrel of wine to know whether it is off," Mr Fischl said. "Most wineries rely on the human nose but that is time-consuming, costly and nowhere near as reliable as Belle, whose nose is 2000 times more sensitive than ours." The owners of Caulfield-based boutique wine label Linnaea buy fruit from the Napa Valley in California and Heathcote in Victoria and they, along with most overseas vineyards, prefer corks for their bottles. Instead of sniffing corks, they decided to train their dog, who was becoming destructive around the house. Coming from a line of search-and-rescue dogs, Belle is particularly sensitive to smell and can even detect a tainted wine through the bottle. Cork taint is a term that applies to wine that has been contaminated either by the wood where it is stored or the cork in the top of the bottle. It has an odour that resembles damp and makes the wine undrinkable. Miss Louisa Belle can detect faulty corks before they are inserted in bottles as well as corks that have broken down when wine has been stored. She can also detect mildew leaf on vines.